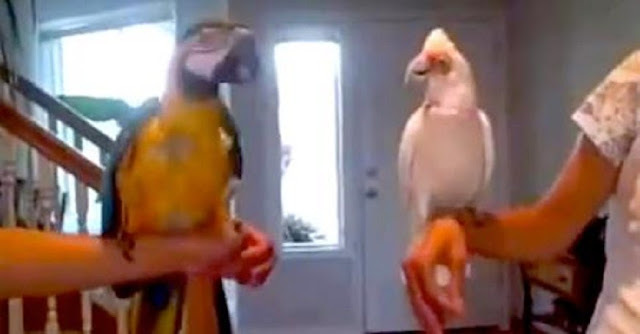 These Birds Challenge Each Other In A Dance-Off—And Leave The Owners In Stitches! I had a pet bird growing up, and I could always count on him for a hearty laugh. There’s something about birds that make them the goofiest animal of all — and I love pretty much every internet video that features our feathered friends. Here, we meet two birds of a feather — Jonathan and Sadie, a macaw and cockatoo. And on this particular day, Jonathan decided to get a little jiggy with it, and he ended up “challenging” Sadie to an epic dance battle. As the two birds fight to the finish, their owners can hardly keep a straight face. Rock it out, guys! At :40, I couldn’t stop laughing either. Watching these silly birds get down and funky almost makes me wanna dance!